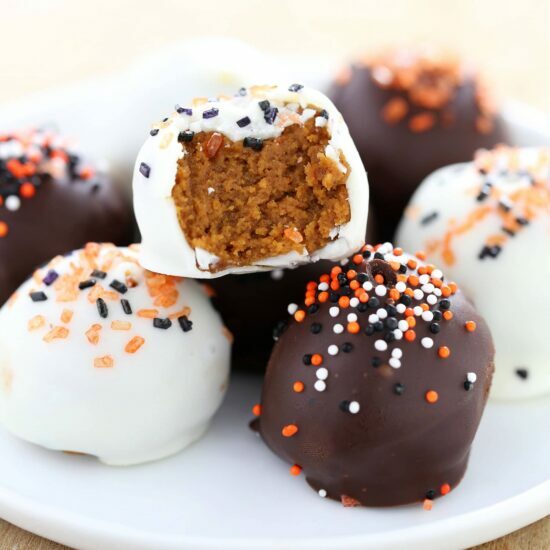 Pumpkin Cookie Butter Truffles are filled with cream cheese, pumpkin, Speculoos cookies, and tons of warm spices then dipped in chocolate. Fall perfection! No baking or chocolate tempering required! Taste: Like pumpkin spice heaven with the added delight of cookie butter! It’s all your fall food dreams in one bite-sized ball. Texture: The chocolate coating is hard and crunchy, while the inside is soft and creamy. Ease: Very easy! No baking or chocolate tempering involved. However, dipping anything in chocolate is bound to get a little messy. Pros: Delightful chocolate coated morsels. Cons: Messy to make and hands-on. I adore the combination of chocolate and pumpkin. So much so that I’m not sure why it isn’t more popular! 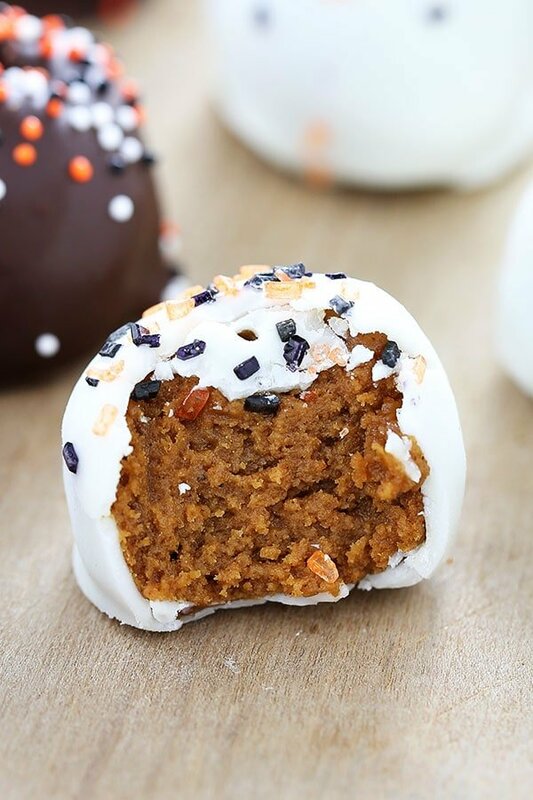 Maybe not everyone is as crazed of a chocoholic as I am, but hopefully the idea of these Pumpkin Cookie Butter Truffles sounds good to you because I am obsessed with them. These were dangerous to have in the house… they lasted all of about 2 days! They’re loaded with tons of pumpkin spice and cookie butter flavors, which tastes intoxicatingly like fall. If you’ve never had cookie butter or Speculoos cookies, imagine gingerbread cookies but like 10 times better. Speculoos are crisp European biscuits filled with warm spiced sweetness. Cookie butter is simply those cookies ground up into a spread, kind of like peanut butter. Now while there’s no actual prepared cookie butter in these truffles, the Speculoos cookies and all the other ingredients basically create a homemade cookie butter. I actually have an entire tutorial showing you how to make DIY Cookie Butter here, if you’re interested. You can find Speculoos cookies at most grocery stores, sometimes they’re simply called Speculoos or they’re under the brand name Biscoff. Typically to get a smooth and crisp chocolate dipped shell in any candy, we have to temper the chocolate. This is a tedious and time consuming process. To avoid that, I’ve added coconut oil to the melted chocolate. You can’t really taste it, but the fact that it’s a solid at room temperature helps to solidify the chocolate shell. If you don’t have coconut oil, you can also use shortening. Either way, the truffles need to be stored in the fridge to avoid melting the chocolate coating. In the bowl of a food processor, combine all filling ingredients. Pulse until well blended. Line a rimmed baking sheet with parchment paper. Scoop the mixture into balls about 1-inch in diameter. I like to use this cookie scoop. Place the cookie balls in the freezer until well chilled, at least 1 hour or up to 1 day. When cookie balls are chilled, combine the chopped chocolate and oil in a medium microwave-safe bowl. Microwave in 30 second bursts, stirring between bursts, until just melted and smooth. Do not overheat. Drop each cookie ball into melted chocolate, coating evenly. Remove with a fork, gently tapping off excess chocolate. Place back on cookie sheet and decorate as desired. Repeat with the remaining cookie balls. I should have known a genius truffle idea would come from you Tessa 🙂 I saw this combo in my bloglovin’ feed and was instantly hooked. Looks so darn good!! Wow Tessa..these look amazing! I’m definitely making them for Halloween. 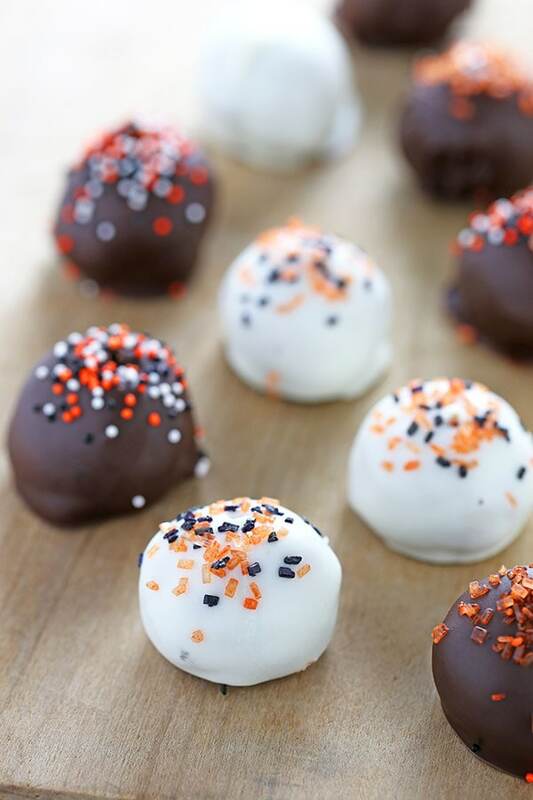 I actually have two jars of prepared cookie butter on hand… can I use that to make these truffles? If so, how would the other ingredients need to be adjusted? Lucky you, Beth! Those jars wouldn’t last long in my house 😉 If you want to use prepared cookie butter, about 1 cup in exchange for the Sepculoos cookies should work. Why not just use actual cookie butter? Wouldn’t it be easier and smoother than grinding up the cookies? I haven’t tried it yet but I’m thinking about doing it this week. Has anyone else tried with cookie butter? 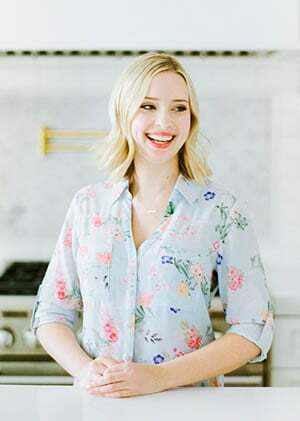 I love your Stories with the Recipes. My Family is not too fond of Cloves, can the 1/8 tsp be left out? Thanks for this recipe. It is very simple and easy. I’m from Ukraine and I like cooking, too. My children like sweets and I want to cook them. These look great. I will be making them for our Halloween potluck at work. They’ll make great little monster eyeballs. Love that! If you snap a picture, share it with me on my Facebook or Instagram. I’d love to see! Where do I find pumpkin purée? It’s usually canned under the brand Libby’s in the baking aisle of the grocery store! We live in Turkey and Speculoos are not an option. Another cookie type suggestion? 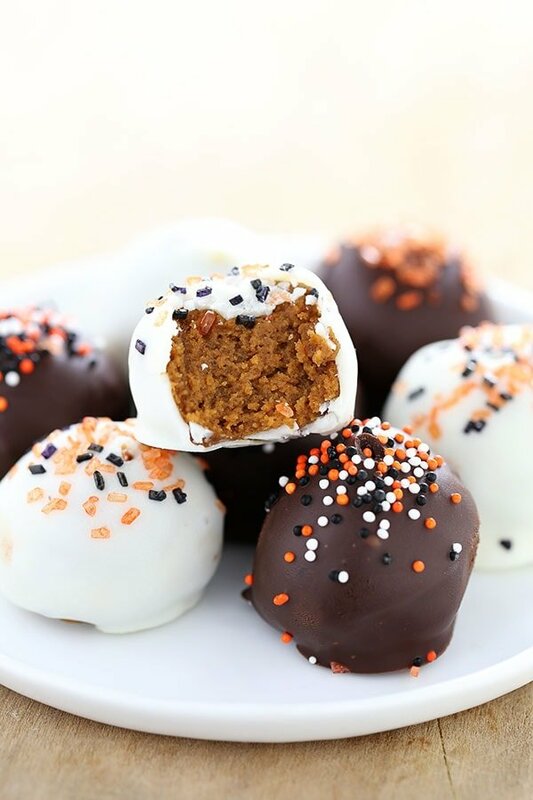 I love all things pumpkin and these just sound too good to pass up. Thank you. I’m not sure what’s available in Turkey, but cookie that is crunchy and spiced should work! Gingersnaps would be a good alternative. Okay, I learned my lesson. Do NOT use cookie butter instead of the actual cookies. I could not get these truffles to harden up. If I take them out of the freezer for more than a minute they become a gooey, oozing mess. Way too soft. Also I just don’t care for the uncooked pumpkin. I know pumpkin is a big thing this time of year but I am really turned off by it. Pumpkin lattes and milkshakes, etc… Why would anyone want to drink pumpkin? I just don’t get it. I am done with pumpkin for the year – well, except for pumpkin pie at Thanksgiving – but maybe not eve then. Sorry to hear you’re not a fan of pumpkin! However, pumpkin puree is cooked! Maybe apples are more your thing during the fall? I am Dutch and Speculoos cookies were a staple at home when growing up. Now in my mid 50s, I am embracing this part of my heritage. I can’t wait to make these and share with my brother and sister, and my mum who is 95! This was sooo scrumptious. I covered it with dark chocolate with cacao nibs. It tastes so rich I can (most of the time) stop after eating just one. Thank you for the recipe! Yum!! You are so welcome!